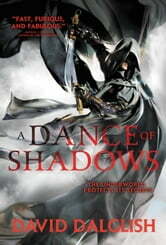 Fantasy author David Dalglish spins a tale of retribution and darkness, and an underworld reaching for ultimate power in this fourth novel of the Shadowdance series, previously released as Blood of the Underworld. A good read although there should be few people left alive after all the killing that goes on. The fight scenes are well done. A continuation of a terrific series. I will truly hate to finish these stories, so get writing Mr Dalgish, you've created a gem.